This unique, drought tolerant, very hardy plant thrives in full sun with almost no maintenance! This unique, drought tolerant, very hardy plant thrives in full sun with almost no maintenance! Rosettes of succulent leaves, 2" wide, have small dark green leaves covered with fine white hairs, and pointed tips sometimes flushed with red. These rosettes form and spread by offsets from the base of a larger rosette. The base plants are the hens, and the offsets are the chicks. Excellent plant for rock gardens, crevices in rock walls, decorative containers, and as ground cover in sunny gardens. They can also be used as colorful, low maintenance houseplants, grown by themselves, or used as filler plants in mixed containers with other houseplants that tolerate dry conditions. Since they don't need much water, they are a great choice to add texture and color to vertical gardens. It is said a rosette will die after it blooms, but it isn't very noticeable because new rosettes are already forming around it. When plants start outgrowing their space, offsets can easily be transplanted to a new area, and will quickly establish themselves if placed in well-drained soil. 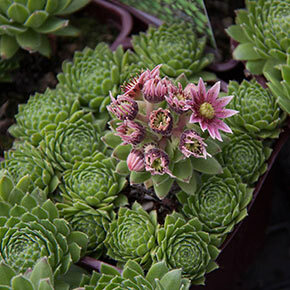 Sempervivum may be used as a uniquely beautiful and environmentally friendly way to roof a building. A green roof can improve water and air quality, reduce cooling needs in summer, and provide additional insulation in winter. Winter Care: Winter hardy. If in a container, store in a garage and only water occasionally, keeping the soil more dry. Or, bring indoors and enjoy as a houseplant. Be careful not to overwater containers. Too much moisture will cause the roots to rot. Flower Form: Star-shaped flowers appear atop short, upright stems. 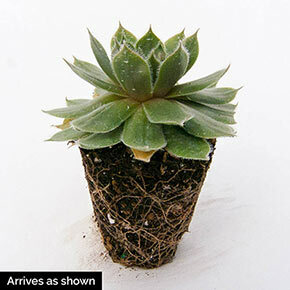 Foliage Type: Small rosettes of thick, fleshy, dark green succulent leaves with fine white hairs, pointed tips are sometimes flushed with red. Soil Requirement: Needs well-drained, light soil. Does not like heavy soil and moist conditions.